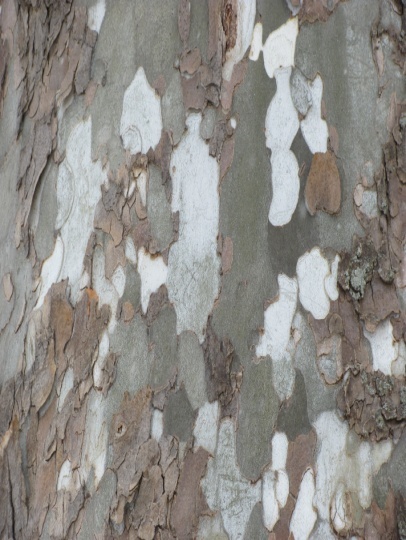 Have you ever driven by the former Marsh Funeral Home at 187 E. Locust Street and wondered what that fabulous tree was that has such interesting textured bark? 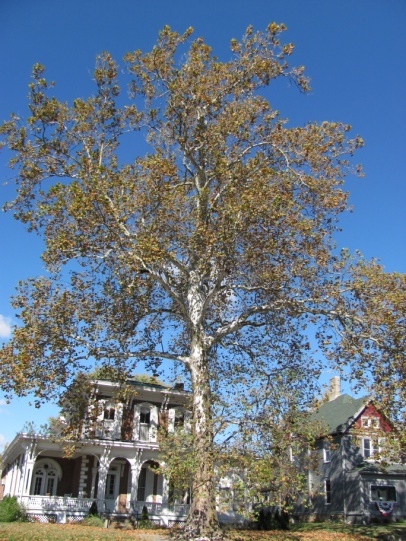 That unique tree is a majestic specimen of the Platanus occidentalis, or Sycamore tree. In 1996, this large tree measured 50.5 inches in diameter at breast height (DBH), and has grown 4 inches diameter in the last 14 years. 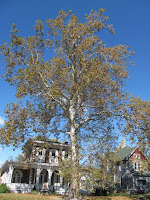 It is the fifth largest recorded Sycamore in Wilmington, Ohio. The Sycamore tree’s irregular spreading of limbs, branch out to form an open head, as shown by the first two photos taken last August and then recently in January. Third photo shows its interesting “camouflage” bark patterns. According to East State Tennessee University, these excellent shade trees are native to eastern and central U.S. They can reach 130 feet high by 6 feet DBH and have an expansive fibrous root system. The mottled exfoliating bark lacks elasticity and is slower growing than the inside, and thus is incapable of stretching like most trees. With increased flaking and peeling of large blotched plates, the bark of the mature branches become tan, greenish-white, gray, and quite smooth. People refer to it as camouflage or even “whitewashed”. Though the trunk on old trees is often hollow, the wood is very “heavy, weak and difficult to split” according to the Wikipedia encyclopedia. Butcher blocks and interior finishes in homes are used with the wood of a Sycamore tree. Most other types of trees form normal buds in August, but the Sycamore tree has an enlarged petiole, which encompasses the bud at its base. The maple-like leaves can be 9 inches long, have 3 to 5 leaf-lobes, are coarsely toothed, and are alternate, “palmately and broadly-ovate”, with short hairs. Normally in autumn the leaves turn brown and naturally fall. However, sometimes both the leaves and the zigzag-patterned twigs suffer from “leaf-blight from spring anthracnose disease” which causes its twigs to fall off and the leaves to defoliate early. Another problem that the Sycamore encounters is the Sycamore lace bug, which feeds on the sap of the undersides of leaves. The male and female flowers form on the same tree in the month of May, along with the leaves. The flowers form 1-inch diameter fruit clusters, which resemble balls or buttons, and hang 6 inches down; thus the common name Buttonwood tree. Branching begins low and it is recommended that we prune young Sycamore trees to promote one central leader. According to Jim Mason of the Great Plains Nature Center in Wichita, Kansas. the “open branching pattern and sheer size of older Sycamores creates good locations for Great Blue Heron nests”. He also notes that raccoons, squirrels and opossums make their homes in the cavities of the trunks. Sycamore trees love sun and are often found along the edges of wetland areas. Several of these rapid growers can be seen north of Wilmington, along the Todd’s Ridge river in the Sycamore Glen sub-division. Their white/gray bark stands out majestically against surrounding foliage. 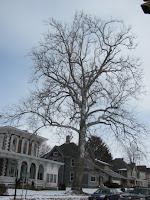 The closely related European London planetree, (Platanus x acerifolia), is also found growing in Wilmington, especially on the Wilmington College campus. The Wilmington Tree Commission encourages you to drive by and appreciate the huge specimen at the corner of Lincoln Street and Locust Street. 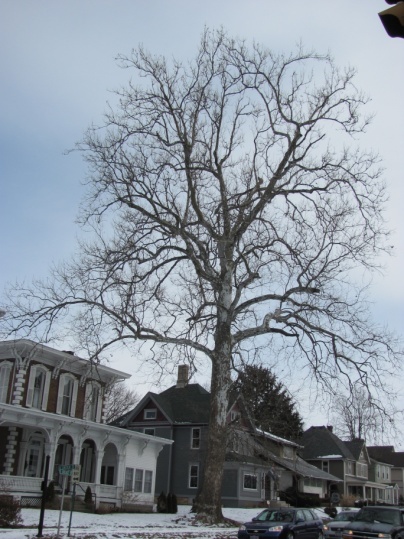 Or better yet, plant a Sycamore tree in your own yard to help us beautify Wilmington! If you are interested in volunteering along with the members of the Wilmington Tree Commission, help is needed to water this year’s new grove of trees that is scheduled to be planted in the spring. For more information, please contact ckrisa@cinci.rr.com.